It's the last day of a long weekend and I am sitting (again, I know) at my patio table enjoying the freshness of the early morning. 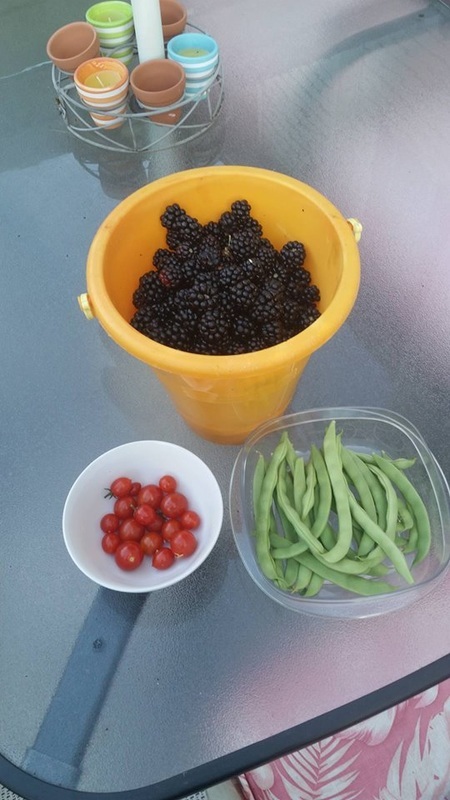 I have watered my container garden and harvested some of the rewards. There are not as many rewards as I had anticipated from this new experience. I cannot help but compare them to the results of gardens past. I am a little bit disappointed, to tell the truth. I can't help but wonder what I did wrong. Did I water too much or not enough? Should I have fed the plants twice a week instead of once? On the other hand, I am satisfied that everything grew and that my backyard looked beautiful. There has been a lot of work put into it. As this growing season is drawing towards it's end, I am already planning for next year. I have some big plans! It will be interesting to see how everything turns out! Enjoy your day, and come sit a spell on the back porch. I have lemonade! Measure into a large jug and stir until sugar is dissolved. Fill jug with cold water and serve over ice in tall glasses.